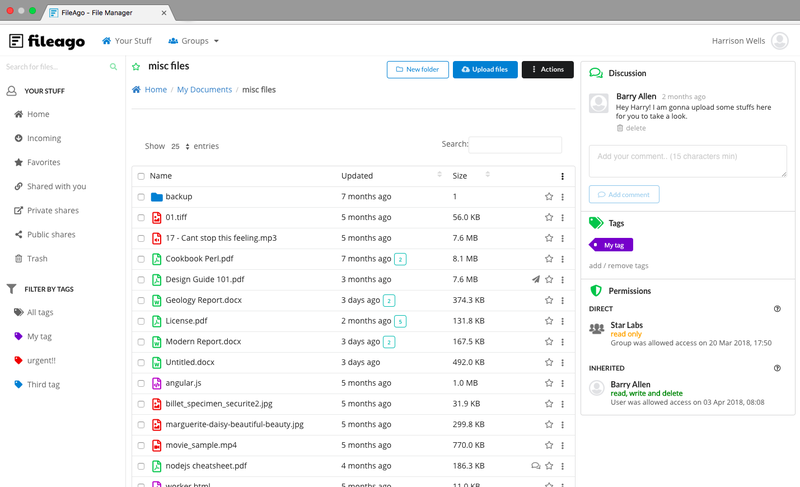 Secure file management software for teams and companies. FileAgo enables teams and companies to securely store files and collaborate among its members. 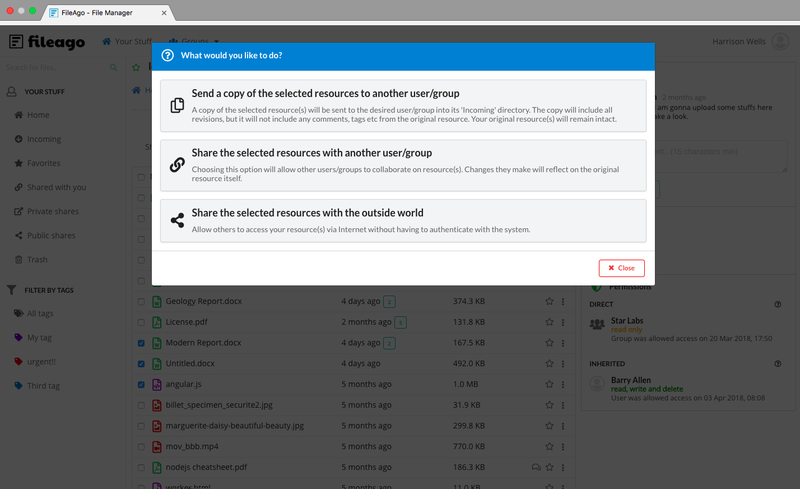 A simple web based file management, sharing and collaboration software which can be familiarised within a few minutes. FileAgo Application Server runs inside your company premise. No data ever leaves your network. 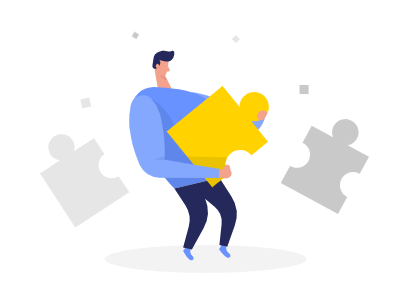 With rich collaboration features and emphasis on strong security, FileAgo is an ideal solution for businesses of all kinds. Mar 12, 2019 : 👍 FileAgo v1.2.0 released. Comes with AD/LDAP support, 2FA, live editing etc. Read more.. Your team mates will love it! Enhance productivity of your team with FileAgo as a centralised platform to store, share, search and retrieve files. 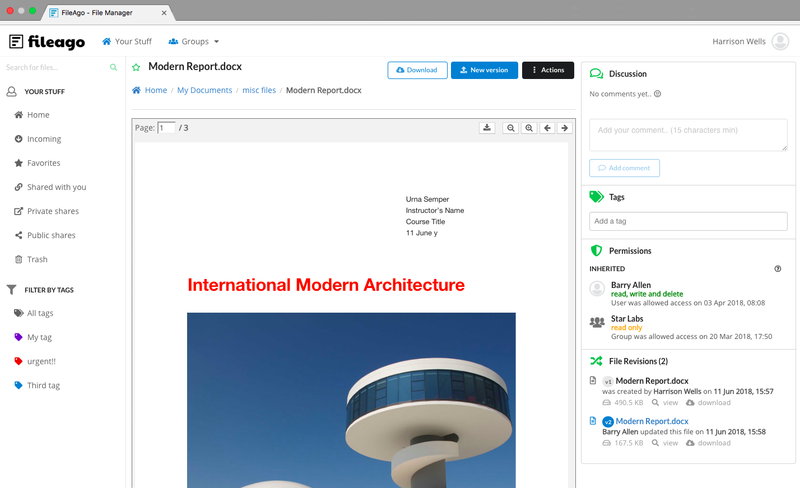 Say hello to a unique concept called Group Workspaces. It is a separate workspace meant for the entire team where team members can save files, and they will be accessible for everyone in the team. All team members receive email notification whenever new files are uploaded, or when changes happen to any of the existing files. Stop relying on the traditional and insecure way of sending files as email attachments. FileAgo offers a secure platform for collaboration and file sharing. FileAgo keeps track of older versions of your files, and they can be accessed and recovered whenever required. Even after you delete files or modify them, you can still recover files and their previous versions with a few mouse-clicks. Deleted an important file by mistake? Or did your hard drive crash? Or even worse, became target of a virus attack or randsomware? By storing your most important files in FileAgo, you can be rest assured that they are safe and secure. FileAgo's security model is implemented in multiple layers. 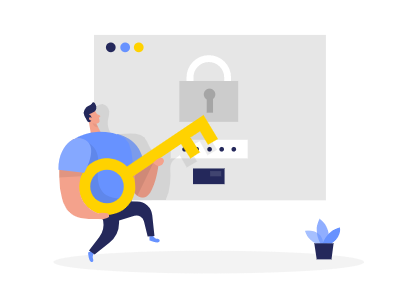 All data is transfered over the network via HTTPS, and is stored at rest (in the filesystem) using AES-256 encryption, thus ensuring that your files are protected from the prying eyes. Users can allow or restrict other users in the organization from accessing files and folders. FileAgo implements waterfall permission model which makes it possible to further override those settings in files and folders under it. If you have used other file management softwares and faced situations where you could never share or restrict access to data the way you wanted, then you have finally found the right solution! FileAgo is one of the most affordable file management solutions available in the market today, and it will remain so for many years to come. 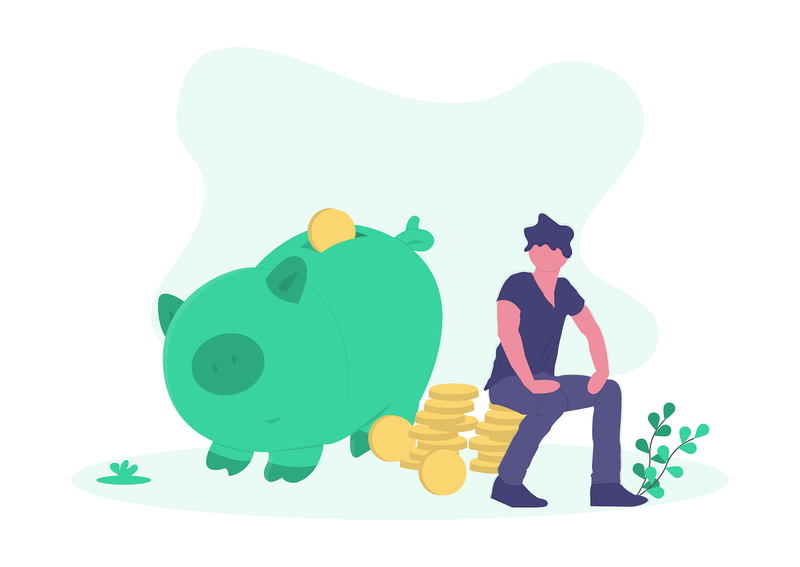 We strive to keep our costs low by keeping things as lean as possible, which is the reason why we are able to pass over those savings to our customers and partners as well. At the end of the day, all we wish for is to see you use FileAgo and help us improve it even more. So, if you need a custom quote? Let us know. Need help installing the software, or require some additional training? Again, just let us know! 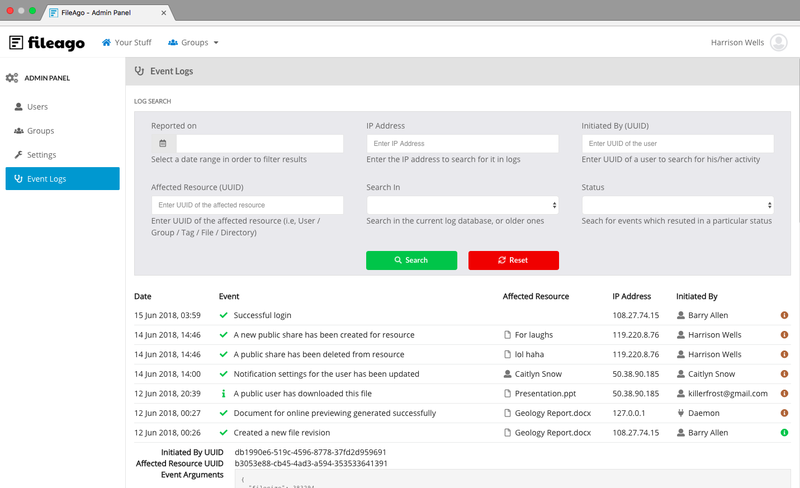 Easily locate and access any file or folder saved in FileAgo. FileAgo keeps track of all changes made to a file, thus making it easy to recover older versions if needed. Preview files of most common formats including MS Office, text, code, graphics and media. Browse https://localhost/ (or the server IP) to begin the installation. Please read the documentation for more details on running FileAgo in production.